Aprés supply storage wall cupboard solutions ideal for office environments when file and document storage is required in the workplace. Having a well-organised custom made office storage wall cupboard solution helps keep the office neat, ensures desk clean policies are maintained and provides cupboard storage within easy reach. 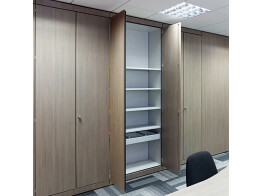 An office Storage Wall cupboard solution can be positioned anywhere within the workplace; they can be free-standing creating office dividing walls or fixed and fitted along any open wall. Being surveyed, designed, and manufactured to suit your specific requirements ensures that a perfect fit is achieved. 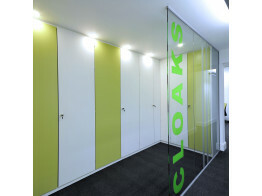 We at Après furniture can arrange to visit your office to discuss your office storage wall cupboard requirements. We carry out a small survey which involves some measurements and come back to you with a detailed drawing of your office cupboards. Once you are satisfied with the configuration of your storage wall unit and we have correctly added your shelving, drawer units and internal filing frames – you sign it off and we start production. 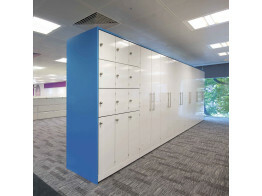 We will then expertly deliver and install your office storage wall cupboards by our specialist fitters. Contact us today to discuss your requirements, we can arrange to visit you or you can visit us in London. Storage Media Wall allows you to integrate any media of your choice with storage if required. 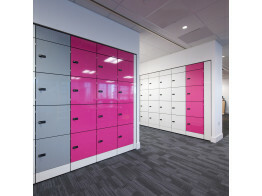 HotLocker personal storage lockers are custom made storagewall units made to measure. 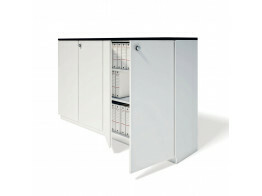 Combi Storage Wall Cupbaords is the ultimate solution in modern office cupboards. 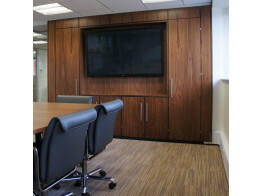 SW9 Storge wall cupboards customised and fitted office supboards floor to ceiling. 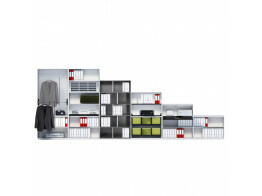 Allvia storage wall solution offers a versatile storage concept of functional and creative elements. Intavis Office Storage System offers storagewall solutions right through to contemporary desk pedestals. 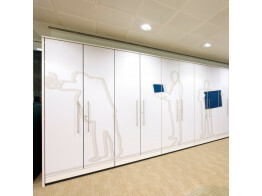 Spacestor storage wall cupboard modules are designed to link on a shared side panel basis.